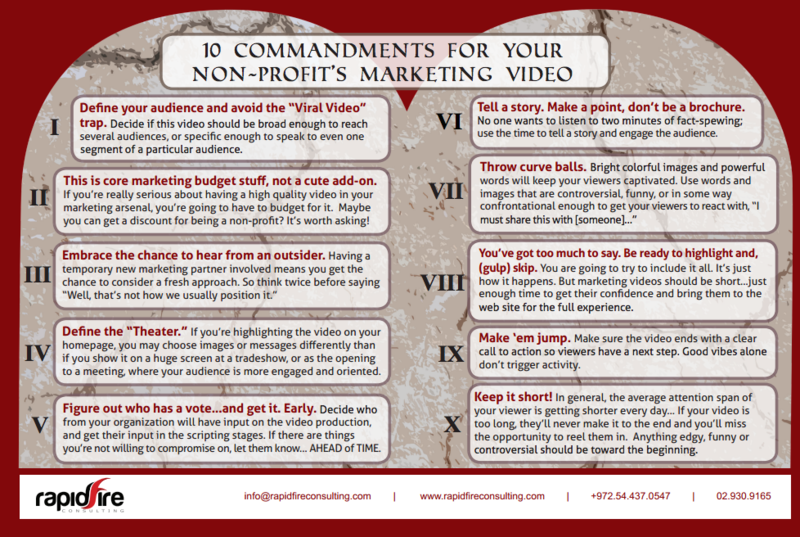 OLAMI Resources / Featured Posts / GUEST POST: 12 Tips that Will Take Your Non-Profit Marketing Video from Good to GREAT! Jay Bailey, is CEO and Creative Director of Rapid Fire Consulting. He has more than a decade of hands-on experience in targeted (but friendly!) online marketing and web design. Most recently he served as the long-time Director of Marketing at the well-known Answers.com. At Rapid Fire Consulting, we’ve collected general “guidelines” that we gathered from the critiques and praises offered about various videos. We hope this, combined with the “10 Commandments” below, will give you a solid list to review as you consider a video script —with us or any other provider. 1) Perhaps the most important lesson we learned was that like all art, video is subjective and there is not necessarily a single right perspective. This is an important lesson, especially internally with your own team or faculty where you may get different types of feedback along the way. Remember that consensus is always terrific, but very often you can produce a top-notch production while specific people still grumble the background. 2) Think long and hard about the audience. This is not as simple as it sounds. A video that you see somewhere else and would like to copy from stylistically may not be the perfect fit for the audience that you’re talking to. Considerations like age, gender, religious background, even political affiliation can all affect perception. We sort of have to step outside ourselves to try to consider these variables. 3) Make sure that your video is produced in high definition (HD) so that it looks good filling the screen. Even if the majority of viewers will see it in a small player on your homepage or on YouTube, there are plenty of people who routinely click on the full-screen button; it will look blurry and pixelated if not done at high-quality to start. 4) There are pros and cons about including a lot of footage in your video. To avoid being redundant, only use selected features and even then, only show them briefly. Try to avoid forcing people to read lots of text. If you are including some text they need to read, remember that a small video player will play it at about one fourth the size of a browser. That means you need to zoom way in to make it readable. 5) One of the cardinal rules of a good video script is that it emphasizes differentiators. Your organization may do whatever it does very, very well, but unless you do it differently than someone else, the audience is not going to be motivated to pay attention to you more than that. 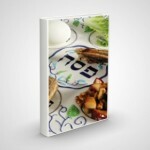 the content easily while focusing on the visual elements. Complex wording will compete for “brain bandwith” with the visuals on the screen and make it hard to completely absorb either one. 7) Metaphors are a terrific way to get a point across, but make sure that they are either abundantly clear on their own, or have a clear explanation that ties them back to your point. 8) If you are going to use cameras to film actual footage, with all of the expense and variables involved, make sure that it’s worth it and it can deliver an end product that is substantially superior than what you can do with animation which is more flexible and can be updated, corrected, changed, etc. Each technique definitely has its place. 9) You can absolutely put together a low-budget, no-frills, simple presentation as long as you have extremely simple, concrete, bold statements that people can focus on and remember. Also, an extremely attractive and appealing call to action helps make the piece memorable and triggers action. All of the bells and whistles that most videos need, can theoretically be circumvented, but we don’t see this often because most organizations need to spend more time explaining the problem and the solution. 10) 90% of videos use some variation of this basic formula: present a problem, present the general solution, and then present the uniqueness of your approach. If one of these ingredients is missing, it’s going to make it less satisfying to watch. 11) Be very careful with high-level buzzwords and broad general statements that can apply to a lot of other organizations or projects. Specificity is the key to making a particular scenario connect to someone who feels a connection to the cause. 12) Watch out for language traps. “If you need…” or using a rhetorical question form might tempt someone to simply answer with “Well, no, I don’t”. Please feel free to print out and share the “10 Commandments.” Hatzlacha!